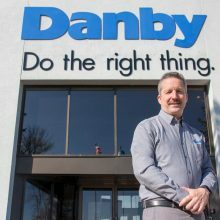 Jim Estill, CEO of Danby Appliances is a Canadian technology entrepreneur, executive, and philanthropist. Jim started a computer distribution business from the trunk of his car while in university. That modest business grew into a company doing $350,000,000 in sales before selling to SYNNEX in 2004. Jim then became CEO of SYNNEX Canada and grew sales from $800,000,000 to $2 Billion over five years. Recently Jim Estill has been making news for his sponsorship efforts to settle 62 Syrian refugee families. The Financial Times, BBC News, The Guardian, and Toronto Life have all covered his story. You can also follow Jim on his blog jimestill.com, which documents his philosophies on leadership and time management. Or watch his TEDx talk. Jim was awarded the Order of Ontario, the provinces highest honour, in 2017. He is a multiple nominee of the Ernst & Young Entrepreneur of the Year Award and has been awarded an Everyday Heroes Award by the Global Hope Coalition. In 2018 Jim Estill was awarded the Order of Canada.